The Bishops Commission for Mission and Faith Formation, a Commission of the Australian Catholic Bishops Conference has just released the following updated version of the Social-Networking Protocols. We hope that this will be helpful to you in navigating a way to use Social Media in sharing the message of Christ in the world. In the vast world of new technology, a myriad of possibilities for communication has been opened up for evangelisation and for building bridges. The Catholic Church recognises the enormous potential which these new technologies bring. Addressing young people who have grown up in a digital world, Pope Benedict XVI in his message for the World Day of Communication 2011 recognised the great opportunities and challenges brought by social networking and the internet. Social networking, using platforms such as Facebook, MySpace or Xt3, is a phenomenon which allows groups to share information, build friendships and promote activities. Indeed, social networking has already proven to be a powerful way to engage with and promote the Gospel of Jesus Christ in a wide variety of fora. 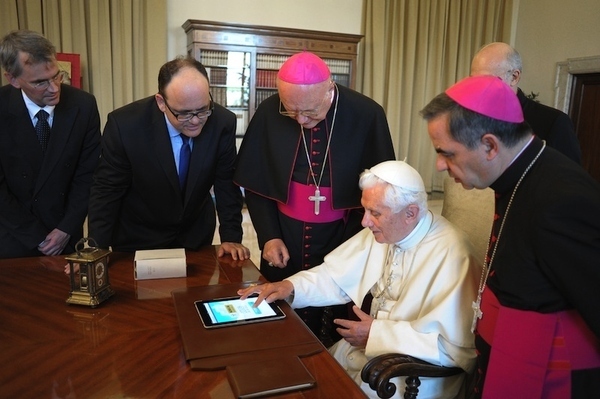 The Church, in her desire to use technology for the greater glory of God, understands that this technology should be pursued only to the point to which it allows growth in faith and in communion with others. The overarching principle in this communion should be that of human dignity, and at each step in the social networking endeavour, care should be taken by Church personnel to ensure that the innate dignity of each person is upheld. These protocols are intended as a guide for those working at various levels of Church organisations. They are by no means exhaustive and may simply form the basis for more comprehensive and specific protocols at local levels. On-line and off-line behaviour of clergy, Church employees and members of Church organisations – particularly those representing the Church – should always demonstrate a Christ-centred love for others. Even those working in Church organisations who might not be Christian should still ensure that when representing the Church, their behaviour off-line and on-line should demonstrate a respect for human dignity. Boundaries should be always be taken into consideration and observed, particular in relating to young people in a youth ministry setting. In particular, those involved in work with young people should be aware of the Church’s child protection protocols and policies of both the Church and of civil authorities. Those who engage in social networking as part of their Church ministry should do so in the name of evangelisation; to build appropriate relationships that can encourage and foster growth in faith. This engagement should facilitate a growing in relationship with Christ. The sharing of information on sites should be of appropriate materials for faith formation or catechesis. Social-Networking sites can be ideal for promotion of Church events or activities and for sharing worship resources in a wide range of formats, be it video, text or sound. The teachings of the Catholic Church should be consistently upheld in these social networking activities, and should not move beyond appropriate personal communication with those being ministered to. Clear distinctions should be maintained between personal and professional communication in the social networking environment. The following pointers might be helpful to Church organisations which wish to engage in social networking on the wide variety of platforms available. Catholic Bishops around Australia have developed some presence on social networking sites such as MySpace and Facebook during recent years, and other Church personnel, members of the clergy or religious, might wish to also extend their engagement in this field. There are a number of options for setting up a profile on Facebook or MySpace which others working in Church might like to consider, based on these experiences. •	Some Bishops have elected to set up a public profile on Facebook, which displays them as a public figure – for example, the Archbishop of Canberra and Goulburn would be listed as a public figure, with a photo and information about his work and ministry. Those using these sites may wish to become a ‘fan’ of the Archbishop as a public figure. This can avoid some of the tensions which can come with accepting or denying ‘friend’ requests. •	Other Church personnel and some Bishops have chosen to set up a personal profile, and accept ‘friend’ requests which a personal profile requires. This allows some control over who appears as an associate on a page, but requires a more consistent engagement with the page. •	Those working in a youth ministry or other Church capacity which could involve social networking should seek permission from their Bishop before engaging in this area – particularly if this involves ‘friending’ people to whom they minister. •	Clergy, Church workers or religious who use social networking sites in a professional capacity should keep this distinct from a private capacity and care should be taken in accepting or adding ‘friends’. There is great potential for a blurring of boundaries in the social networking field. •	Those Church organisations which wish to engage officially in social networking activities might choose do so as a group, and found a page which can be administered by a number of people – for example, Darwin Youth Ministry might be the name given to the profile, rather than the name of one of the Youth Ministers in the Diocese as an appropriate way of setting boundaries in that ministry relationship. This system does not prevent Church workers from having their own personal profiles; it simply places a clear line between personal and work. This can also remove any ambiguity about friendship relationships or ministry relationships. •	Church groups and organisations – particularly those which are officially recognised as speaking for the Church on various matters, should be placed under the ‘Religious Organisations’ grouping on social networking sites and should clearly identify that they are members of or coordinators of the Official Group of the Diocese/Parish/Catholic organisation. •	The use of photographs or videos should be carefully monitored, and permissions should be sought from all who appear in photographs or videos before being posted or tagged. While in some public contexts, it can be assumed that people know they are being photographed to go on a website or a Facebook page; other situations might not be so obvious. Material should always be appropriate, and the sharing of embarrassing or offensive photos or videos should always be avoided. •	Church networking activities should be monitored by a third-party where possible, and where this is difficult, the Church worker should refer to underlying principles and teaching of the Church. Commentaries appearing on social networking sites of a rude or offensive nature or those which are vulgar or which could be interpreted as bullying should be immediately removed. •	Privacy should be of the utmost importance, and care should be taken to protect people, especially youth, from their personal information being displayed on a social networking site. This particularly refers to phone numbers and email addresses. More and more, Twitter is being used in the news media, by celebrities and by organisations to promote events, to share information and to provide quick updates about various issues. By ‘tweeting’ a sentence or two about a Church website or event, potentially thousands could be pointed back to this information. Twitter is a free social networking tool, yet has the power to disseminate information quickly and efficiently. Like with all social networking engagement, Church entities should reflect carefully before posting on Twitter that their messages reflect Church teaching and Christ-centred principles. Blogging is a conversational and reflective mode of communicating which is cost-effective and allows people to express their views in a relatively unmoderated forum. A number of priests, religious and lay people within Australia maintain excellent blogs which can be helpful for the promulgation of faith. Once again, Church workers should try to consistently represent the Church in a positive light and communicate evangelically using this medium. YouTube is an online video site which allows individuals and groups to post videos of up to 15 minutes on any topic. The Catholic Church has an extensive presence on YouTube in both official and non-official capacities. Like with all social networking, the use of YouTube can assist in the work of evangelisation and promotion of the activities of the Church. Church entities should ensure that all material posted on YouTube or other video-based sites is in accordance with Church teaching and respects human dignity. Ethical considerations should be applied when uploading content, and explicit or offensive material should be avoided at all times. One of the gifts provided through World Youth Day 2008 was the foundation by the Archdiocese of Sydney of the faith-based social networking site, Xt3. While the page is more than simply a social network, it does contain many of the features of sites like Facebook and MySpace. The difference is its commitment to Christ-centred content. Xt3 contains portals for video; catechetical materials; homilies; blogs; sound and video. It also gives opportunities to ask questions of priests or chaplains about faith and life. The above guidelines on appropriate social networking behaviour are, of course, applicable to all social networking sites, including those which are faith‐based. While the gifts of social networking are vast, it is important to remember in our engagement that the digital world is not exclusive. Social networking should never replace real relationships with people, and particularly in a ministry context, efforts should be made to avoid simply digital relationships. This is also important in the sense of retaining the Church’s focus on the poor. The majority of the world still cannot afford a computer, many have little access to educational possibilities and as such struggle with literacy; or perhaps they live in remote areas with limited access to technology. Hearing others talk about their social networking experiences can be profoundly isolating for those unable to take part. Ultimately, while there are many strengths and much to be gained from social networking, it should be just one of a variety of means we might use in our Church organisations to bring about a message of Christ in the world. This entry was posted in Press Releases, Uncategorized on November 30, 2011 by Mark Wei.